The donate link was not working in the Hawk Extra that was sent out yesterday. It is now fixed. DONATE to our RAFFLE BASKETS! The Embrace Winter FAMILY Social is less than two weeks away (Friday, 2/1, 7-9 p.m.)! Sadly, however, we don’t have much in the way of donated items for our raffle baskets. Can you help? Please donate themed items by dropping them off, contained in a shopping bag and clearly labeled by grade, at the main office now through 25th. If you do not have time to shop and would prefer to donate cash, click here to Donate and the money will be either pooled to buy additional items or will go towards the cost of the basket itself. 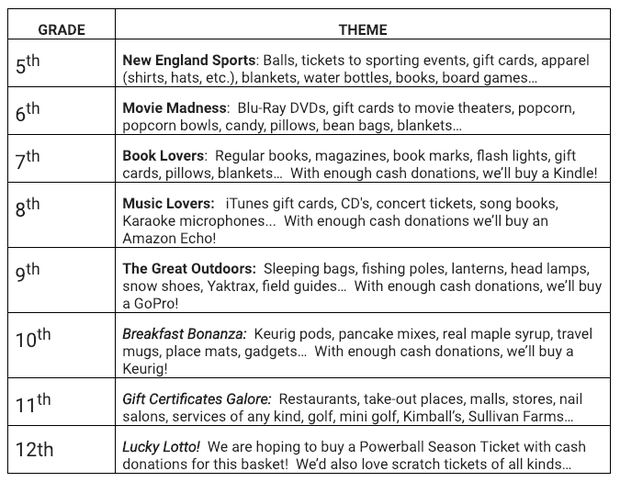 The themes are listed below. Anything related to the topic will be great! The idea is to be creative and have fun. Cash donations will be pooled for big-ticket items!